Ross Valley Fire Department maintains a creek level monitoring system to monitor runoff in three major tributaries of Corte Madera Creek prone to flooding (San Anselmo, Sleepy Hollow, and Fairfax Creeks). We post real-time data to our website for public viewing, below. This data is provided as a community service, and is not intended to be used as a sole source of information regarding flood risk or hazard. This information should not substitute for common sense or disaster preparation. 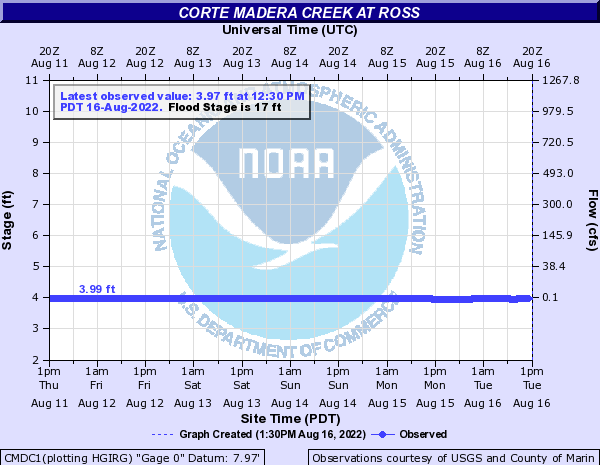 Creek level charts refresh every 15 minutes. IMPORTANT: Please do not call for website support during extreme weather events. Fire Department staff are extremely busy responding to emergencies and can't troubleshoot computer issues. Bottom of Lagunitas bridge is 18 ft.
Creek cameras are for visual reference only, and should not be relied upon to make decisions about life safety or property. Email rvfdcreeks@xmrfire.org with questions or technical issues. The AlertMarin emergency alert system uses geolocation, email, and SMS messages. More information on high tides and flooding can be found here. PG&E Provides a "real-time" online map showing known power outages in your area. Click on a marker to see more information, such as number of customers affected and estimated time to restore power. Never approach downed power lines. Do not attempt to move downed lines of any kind. Never attempt to step over downed lines. Move away and report the downed lines by dialing 9-1-1. Anticipate power outages prior to the storm, and bookmark PG&E’s power outage page. If the tree is on private property or has fallen onto private property contact the property owner. If the tree is touching electrical wires contact PG&E at 800-743-500 or non-emergency dispatch at 415-442-4526. If the tree or limb is causing an immediate danger, call 911 from any land or mobile phone. If the tree or limb is blocking a public right of way or roadway, contact your local Department of Public Works. When driving in the rain, use extra caution and always have your headlights on. Remember, if you turn on your windshield wipers, turn on your headlights. Please obey the speed limits and follow other traffic at a safe distance. Do not drive through standing water. Only 6 inches of water can be enough to stall your car and cause irreparable damage to the engine. Please anticipate road closures and traffic back-ups due to flooding, downed trees or landslides. Check traffic conditions before you hit the road. How can you minimize your landslide risks? If you discover any earth movement or landslide, immediately leave the area and notify neighbors and emergency services by dialing 911. A disaster supplies kit is simply a collection of basic items your household may need in the event of an emergency. Visity ready.gov for resources on building an emergency kit. How quickly your company can get back to business after an emergency often depends on planning done today. Ross Valley Fire Department encourages all business owners to start planning now to improve the likelihood that your company will survive and recover. Develop a continuity of operations plan. Carefully assess how your company functions to determine which staff materials, procedures and equipment are necessary to keep the business operating. Review emergency communications with staff. Set up a telephone calling tree or email alert to communicate with employees, designate an out-of-town phone number for employees to call, give employees wallet-cards with important phone numbers. Review how to decide to stay or go. Have an Evacuation Plan and a Shelter-In-Place Plan. We will provide updates about the storm as needed on our website. Sign up for Alert Marin to receive notifications on your devices and phone! Emergency officials use Alert Marin to deliver incident-specific information or potentially life-saving instruction to the precise geographic area(s) affected. Sign up for Nextdoor - a private, neighborhood-based social network. Nixle will send alerts to your mobile phone or email. In an emergency, call 911 immediately from any wired or wireless phone. An emergency is any situation that requires immediate assistance from the police, fire department or ambulance such as a fire, a car crash (especially if someone is injured), or a medical emergency where a person is requiring immediate medical attention. If you hear the Town's Emergency Siren, do not call 911. Instead, look for immediate danger, move to high ground if you are in a flood zone, and tune in to KQED 88.5 FM, KCBS 740 AM or KGO 810 AM and local TV stations for further information. Flood Warning: Issued to warn the public that flooding is occurring or is imminent. Flash Flood Watch: Indicates that flash flooding is a possibility in or close to watch area. Flash Flood Warning: Signifies a dangerous situation where rapid flooding of small streams or urban areas is imminent or is occurring. Urban and/or Small Stream Flood Advisory: Alerts the public to flooding which is generally only an inconvenience (not life threatening) to those living in affected areas. During winter storm events only. Locations may change. Please bring your own shovel! San Anselmo: Sunny Hills Drive, in the parking lot adjacent to the tennis courts (sand and bags). This location is directly across Sunny Hills Drive from Swirl, the yogurt shop in the Red Hill Shopping Center (San Anselmo Residents Only). Ross: Entrance to Natalie Coffin Green Park at the end of Lagunitas Rd (sand and bags). Town of Ross Corporation Yard no longer has sand and sand bags (Ross residents only). Sandbags are a simple and effective way to prevent or reduce floodwater damage. Sandbags act as a barrier to divert moving water around instead of through buildings. Sandbags must be constructed properly to form a watertight seal. Remove debris from the area where bags are to be placed. Place adjacent bags to overlap slightly on the folded or flared portion of the previous bag and stamp into place to eliminate gaps and form a tight seal. Stagger subsequent layers of bags, similar to the pattern of bricks on a wall. The Town of San Anselmo maintains a flood horn located in the Town Hall tower. The horn is audible from most areas subject to flooding. The horn is sounded when flooding is imminent, approximately 13.5 feet. Town staff will sound the horn with 5 blasts, a pause, 5 blasts, a pause and 5 blasts. A protocol with Fairfax and Ross dictates that if they sound their flood horns or sirens, San Anselmo will activate their horn as well. If you hear the flood horn: evacuate to high ground; avoid downtown and low-lying areas. The Town Manager and Police Chief will make the decision to sound the horn based on written policy and observed conditions. The Fire Department does not sound or maintain the horn. Please contact Fairfax Police Department with questions about the siren: (415) 453-5330. The protocol is to sound the flood siren when flooding is imminent, which in Fairfax, is 7.2 feet. When the siren is sounded, residents and merchants are advised to proceed immediately to a higher floor or to higher ground. A protocol with San Anselmo and Ross dictates that if they sound their flood horns, Fairfax will activate their siren as well. This is despite the fact that the flood stage in Fairfax is lower than San Anselmo. However, if they are at flood stage, there is the possibility Fairfax will flood as well. The Fairfax flood siren does not mean come downtown to see the creek or move merchandise to higher areas. It is too late. Seek higher ground. The Town Manager and Police Chief will make the decision to sound the siren based on observed conditions. The Fire Department does not sound or maintain the siren. 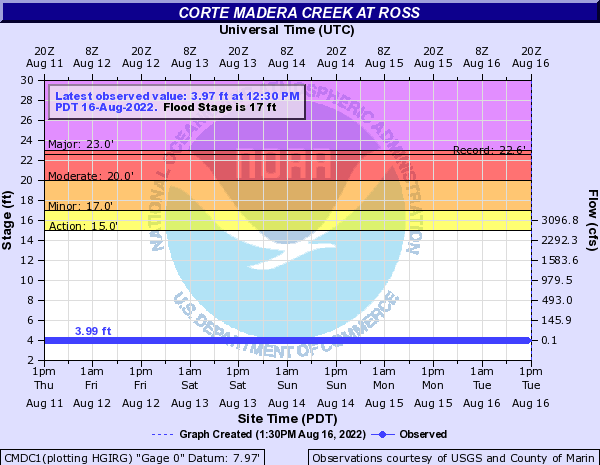 The Town of Ross sounds a flood horn when flooding is imminent, which in Ross is typically 19 feet. When the horn is sounded, residents and merchants are advised to proceed immediately to a higher floor or to higher ground. A protocol with Fairfax and San Anselmo dictates that if they sound their flood horn or sirens, Ross will activate their horn as well. The Ross flood horn does not mean come downtown to see the creek or move merchandise to higher areas. It is too late. Seek higher ground. The Town Manager and Police Chief will make the decision to sound the siren based on observed conditions. The Fire Department does not sound or maintain the horn.